Maintain a well-groomed beard with this 4-piece kit. 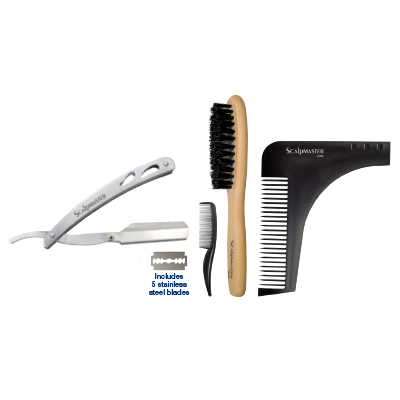 Includes: Stainless-Steel Shaving Razor with 5 replacement blades. Provides a close, smooth shave without irritation. Measures 5-1/2" long when closed and 8-1/4" long when open. 3" Mustache Comb. 100% Boar Bristle Beard Brush great for grooming and smoothing beards. Measures 1/2" wide x 6-1/4" long. Beard Styling Tool used to easily shape and groom perfect symmetrical facial hair on the neckline, cheek line, jaw line, and goatee.